If you're stopping by Japan in the near future, you can party like it's 2002 with season one of The Osbournes! 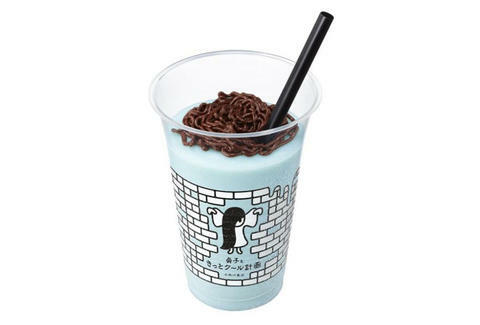 a new milkshake themed after that creepy girl from The Ring. Japanese fast food chain Lotteria is rolling out a limited edition lemonade shake to honor/placate the TV-dwelling villain, known as Sadako in her native land. They colored this drink blue to match Sadako's ratty dress, then added in some chocolate sauce and a black straw to evoke her dark hair -- as you can see in the photo above, the resemblance is striking. The shake debuts this Saturday to hype up the August 30th release of Sadako 3D, a movie that the Japanese government is weirdly stoked about. Apparently the Ministry of Environment is working with Lotteria to promote the drink, and has even named Sadako an official Summer mascot. So either the Ministry of Environment doesn't have a lot going on, or they just got a prank "seven days" call they're taking way too seriously.